We’re all about making sure you’re completely comfortable during your time with us, and one of the ways we ensure that comfort is by using the most advanced technology we can. With it, we’re able to address an even wider array of problems in less time while keeping procedures completely pain-free. Sounds pretty nice, right? Modern-day dentistry can accomplish some truly unbelievable things these days, and to see evidence of that, you need to look no further than Yenzer Family Dental! Your TMJ refers to the small hinges on your lower jaw that allows it to move fluidly whenever you eat, speak, laugh or yawn. 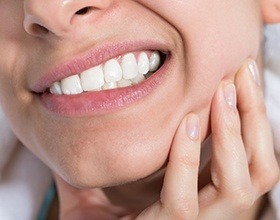 Like other joints in the body, it can sometimes become strained or injured, leading to chronic jaw pain, frequent migraine headaches, and even unconscious teeth grinding. If any of these symptoms sound familiar to you, be sure to come see us to get the relief you need. We’re able to address TMJ problems using effective, non-invasive treatments such as equilibrations/adjustments and occlusal splints. 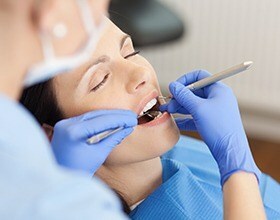 Does going to the dentist make you or your child feel a bit nervous? That’s perfectly okay, and we’re more than happy to help you relax. With nitrous oxide sedation, all a patient has to do is breathe in the colorless, odorless gas through a small nasal mask in order to achieve a warm, happy, and euphoric feeling in the dental chair that helps nerves quickly melt away. The mask will stay on for the entire appointment, and once it is removed, the gas’ effects wear off almost instantly, enabling a patient to go straight back to their day. Our Gendex intraoral camera lets you finally see your smile from your dentist’s point of view! This small, pen-sized camera can be comfortably maneuvered through the mouth to capture high-resolution images of your teeth and gums we can then display on a large chairside monitor. This will give us a chance to better explain what we are seeing and show you exactly why we might be recommending a certain treatment. 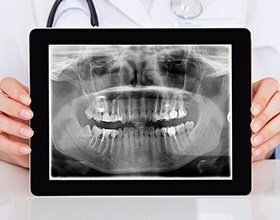 Thanks to Gendex digital X-rays, we’re able to take better care of our patients while giving them peace of mind as well. Not only do digital X-rays create highly-detailed images much faster than traditional ones, but they also expose our patients (and us!) to 90% LESS radiation in the process, which is especially good news for parents with small children. 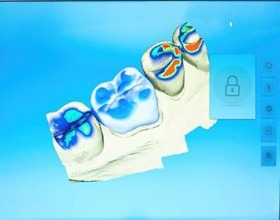 And, because everything is digital, the images can be easily sent, stored, and displayed on a nearby monitor for you to view with your dentist. 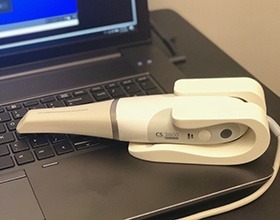 In situations where we need to look at your TMJ muscles or plan a complicated treatment such as dental implant placement or wisdom tooth extraction, we’ll use our 3D cone-beam scanner. 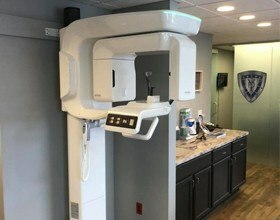 This device gives us the ability to create a fully three-dimensional X-ray image of your teeth, gums, and other nearby oral structures. 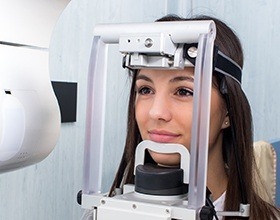 This gives us just a little bit more information than your typical X-ray, allowing us to better personalize your care so not only will a procedure be successful, but your recovery will be easier as well. The GEMINI soft tissue laser gives us the ability to perform sensitive periodontal (gum) procedures with both speed and precision. 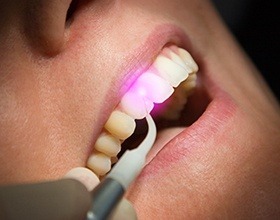 The laser’s highly-concentrated beam of light is able to instantly vaporize bacteria along the gum line and painlessly remove any infected tissue. And, it can accomplish both of these tasks while not harming any of the surrounding healthy tissue. It’s even able to limit the swelling and bleeding a patient may experience during a treatment to make it one of the most patient-friendly tools we use every day. The Caresteam 3600 digital impression systems allows us to create a highly-accurate impression of your teeth without using goopy and odd-tasting dental putty. Rather, a small handheld device will glide effortlessly through your mouth and capture hundreds of unique images which software will “stitch” together to generate a 3D digital impression. Not only is this process MUCH more comfortable than the traditional one, but it also produces a higher-quality impression. Do you regularly feel exhausted during the day, irritable, or have trouble remember things? Have you almost fallen asleep behind the wheel because you just can’t seem to get enough rest? If so, you may be suffering from sleep apnea, a serious disorder that can not only rob you of your sleep, but your overall health as well. Dr. Jeff Yenzer has successfully been able to help sleep apnea patients using customized oral appliances, which are small mouthpieces patients only need to wear to bed. With one, a patient will be able to sleep symptom-free and wake up feeling refreshed and energized in the morning. It also offers a great alternative for those who are tired of using their CPAP machine! At Yenzer Family Dental, we are dedicated to using the latest dental technologies to create a better dentistry experience for every patient we treat. By introducing the iTero scanner to our office, we have fully integrated our treatment process. 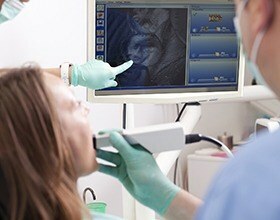 The iTero scanner is used to capture digital impressions of patients’ smiles. These impressions can be instantly transmitted to the dental lab, so the technicians can begin creating your dental restoration, oral appliance, or Invisalign orthodontic aligner right away. This can shave days or weeks off the treatment process, reduce the risk for human error, and improve the entire treatment process from start to finish. Enhance the services you receive using the clarity and pinpoint accuracy of i3D technology. The simple scan creates three-dimensional images of your mouth and oral structures for precise diagnosis and treatment planning. This allows Dr. Yenzer to create solutions catering to your specific needs while eliminating any room for error to promote your oral health and functions.